Who doesn’t love a jam-packed goodie bag? Well you can expect tons of goodies at Festival, only this time around you’ll be filling your exclusive WH shopper to the brim yourself. That’s right, make your way around the festival and pick up tons of freebies, vouchers and goods, and pop them into your bespoke WH shopper. We’re talking a ghd R500 voucher for everyone, Pond’s 7-day samples, vouchers from FoxBox, and the new delicious Nature’s Valley Granola Bars, not to mention L’Oreal’s Elvive Curl Nourishment Low Shampoo (worth R100) and the L’Oreal Pure Clay Purity Mask (worth R160). No doubt you’ve heard of hot yoga, but have you given it a go yet? Well now’s your chance… Come get your yoga on in the cocoon-like inflatable that’s heated to 37 degrees. This genius pod has been designed to super-charge your yoga experience through unique interior design with dim, purple lighting, a beautifully scented environment and urban-chill tunes. There will also be plenty of spoils from Cotton On Body here – so be sure to register for one when you arrive to avoid missing out! No need to worry about not looking your festi-best after working out at the Fitness Stage. We’ve got plenty of stations to freshen you up: Starting with the Shield spritz station, then of course there’s the ghd styling bar where you can have your locks styled for free. 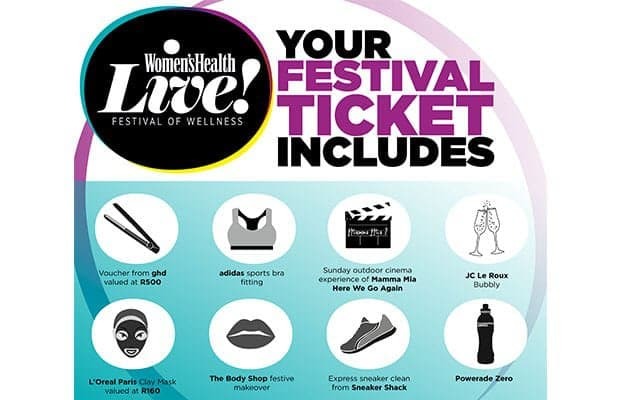 The Body Shop will also be there to give you the festival makeover of your dreams, while the Sneaker Shack will be on hand to give your takkies a free express clean! Across two stages, the Women’s Health editors will be in conversation with leaders in the fields of health, food, finance, entrepreneurship and more. Don’t miss our Ed, Danielle Weakley, sitting down with last month’s WH cover star, Unathi, as they talk about 40 being her fittest age yet! Pssst, we’ve planned a little birthday surprise with JC Le Roux for Unathi’s birthday that you don’t want to miss. 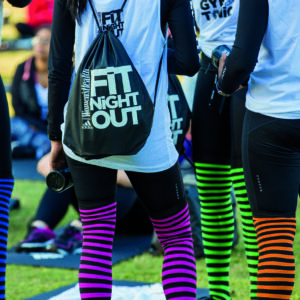 Whether you’re in the mood for some hot new activewear or fancy crossing Christmas gifts off your to-do list, our Festival market is filled with gorge goodies. 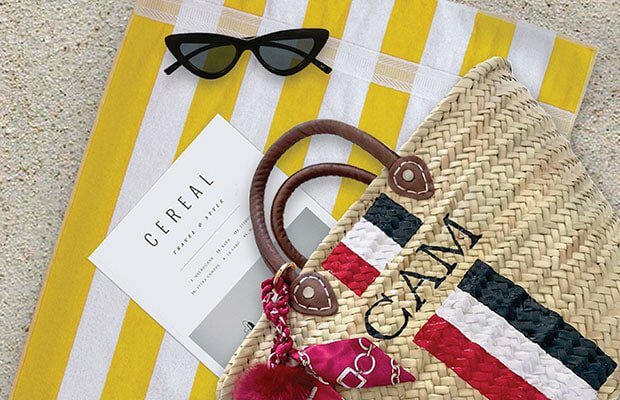 We’ve rounded up our fave local brands (as seen on Instagram) and gathered them in one place for your festival-shopping pleasure! Yes – there will be delicious food to munch on all weekend. The Fry’s Plant-Based Foodcourt will have the vegans covered, while Griekse Boertjie will be offering up delicious Greek dishes. Our friends from Sushi bus will be there too – as will Yococo dairy-free ice cream, Frost Popsicles, The Juice Girls and plenty of coffee to keep you buzzing. You called for it at FNO and we’ve listened – there will be plenty of adult-friendly drinks for you to enjoy with your squad throughout the weekend. You may fancy a glass of Fleur Du Cap, some JC Le Roux bubbles or perhaps hanging out in the Gordon’s Gin garden? The choice is yours! 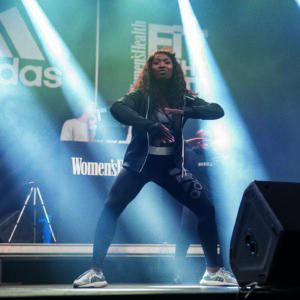 Our adidas fam will be on hand all day to measure you and make sure you’re wearing the correct sports bra for your body. Plus chat to loads of their fit-stars about their wellness journeys, workout routines and fitness tips. Don’t forget to grab a selfie for Instagram! 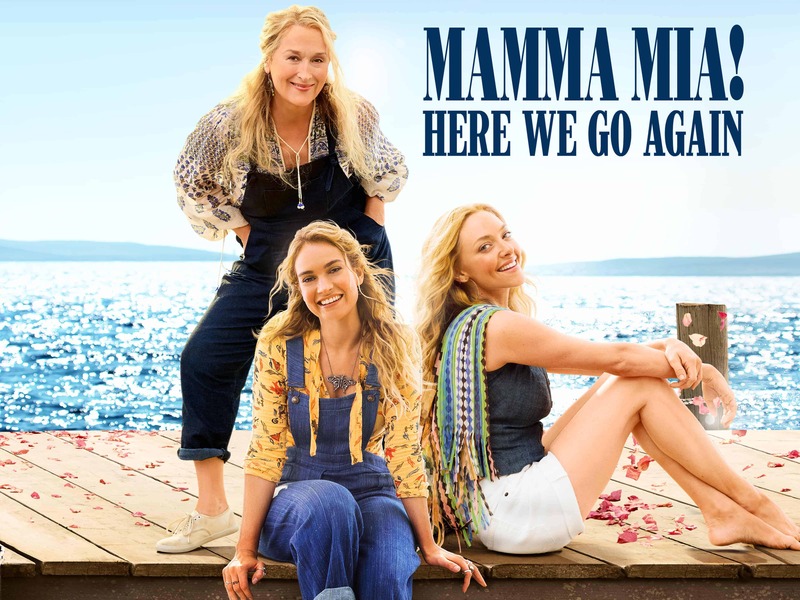 Sing the Sunday blues away to Abba’s best in Mamma Mia 2. We’re proud to announce we’re hosting the outdoor cinema premier of this musical comedy as the final feature in our festival programme. The flick will begin at 3:30pm on Sunday so be sure to stick around and enjoy it with us! Determined to be part of the fun? We don’t blame you. If you haven’t got your Festival tickets yet then grab yours here.